There’s a restaurant in my neighborhood that has a vegetarian Nashville Hot “Chicken” Sandwich made with tempeh that is sooo good even though it hurts sooo bad. Spicy food lovers, you know what I’m talking about, right? Well, I wanted to make something similar at home, but I decided to go the buffalo sauce route instead. 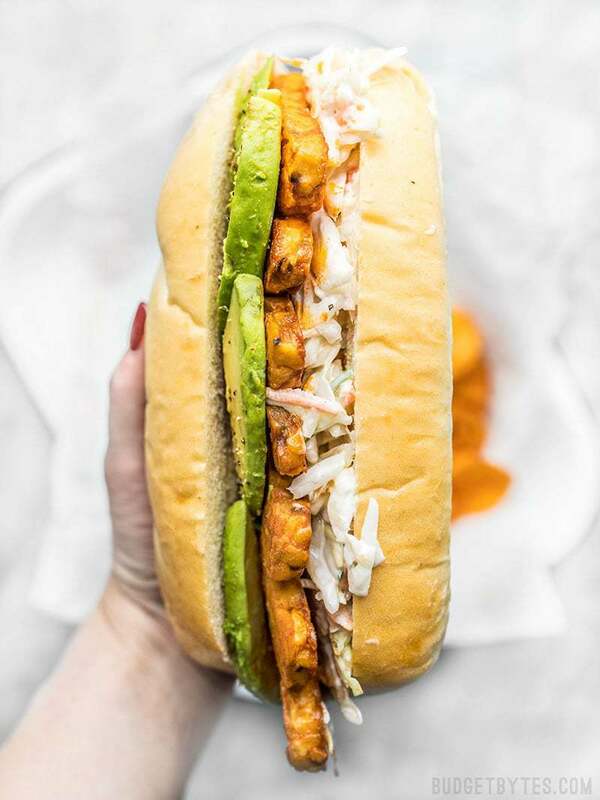 Fresh avocado and a super simple ranch slaw offer just the right amount of creaminess to dampen the flames of the homemade buffalo sauce, plus they give a much needed dose of vegetables to keep things fresh. Heat seekers, you’re going to love this one!! 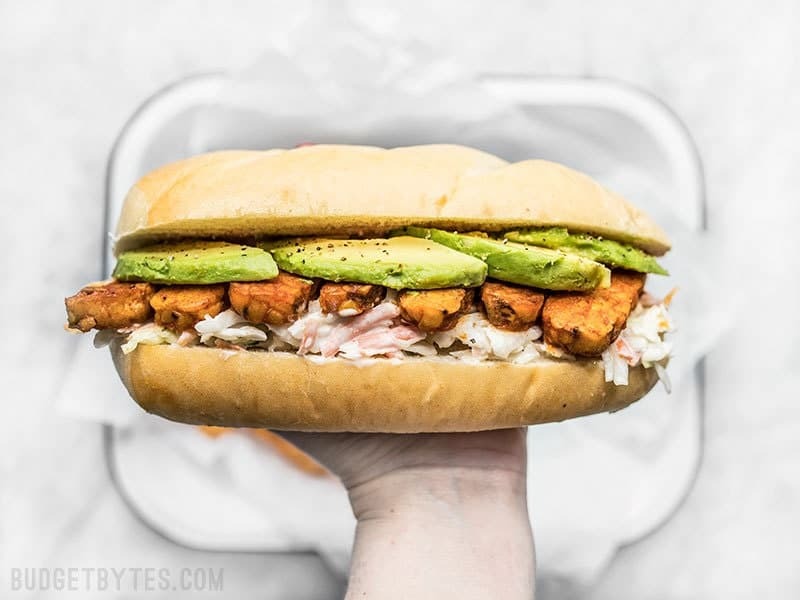 This Buffalo Tempeh Sandwich would pair really well with Cumin Lime Sweet Potatoes! Please do not substitute or leave out the avocado or ranch slaw. 🙏 These two things in combination with the buffalo sauce create perfect balance. Take away any one of the three and these buffalo tempeh sandwiches just won’t have the same magic. If you’re not into sandwiches, you can serve this as a wrap, or even over a bed of greens or rice as a bowl meal! Not into tempeh? You can totally do this with chicken, too. Either cook up pieces of chicken breast or thighs in a skillet like I did with the tempeh, then drench it in the sauce, or use pulled meat from a rotisserie chicken. 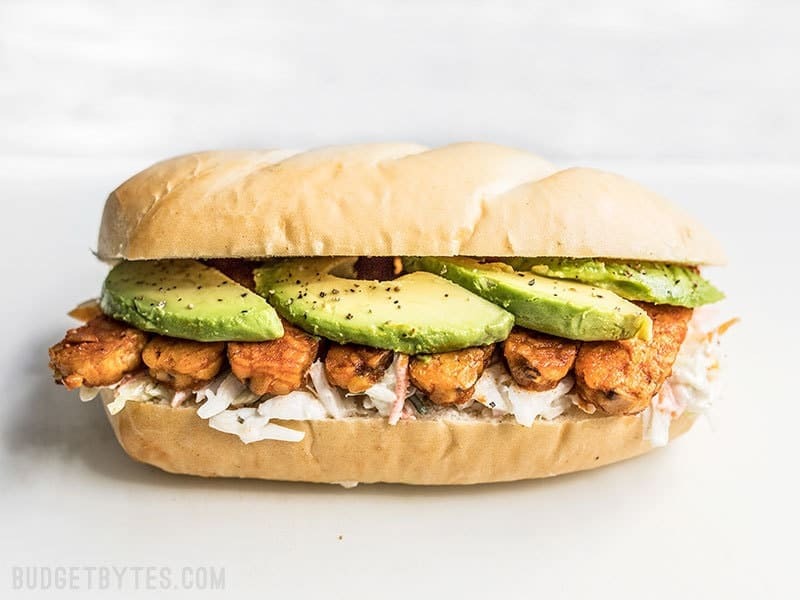 Spicy hot buffalo sauce, creamy avocado, and a rich and tangy ranch slaw makes these Buffalo Tempeh Sandwiches fiery perfection! Whisk together the melted butter, hot sauce, smoked paprika, garlic powder, and salt. Set the buffalo sauce aside. The sauce may thicken as the butter cools, but it can be heated through again just before use to smooth it out. Add the coleslaw mix to a large bowl, then pour the ranch dressing over top. Stir until the shredded cabbage and carrots are coated in dressing, then refrigerate until you’re ready to build the sandwiches. Slice the tempeh into 1/4-inch thick slices. Heat 1 Tbsp cooking oil in a large skillet over medium. Once the skillet and oil are hot, swirl to coat the surface of the skillet in oil, then add the tempeh slices. Fry the slices until golden brown on the bottom, then flip and cook on the second side. Add an additional tablespoon of oil for the second side, if needed (tempeh tends to absorb the oil). 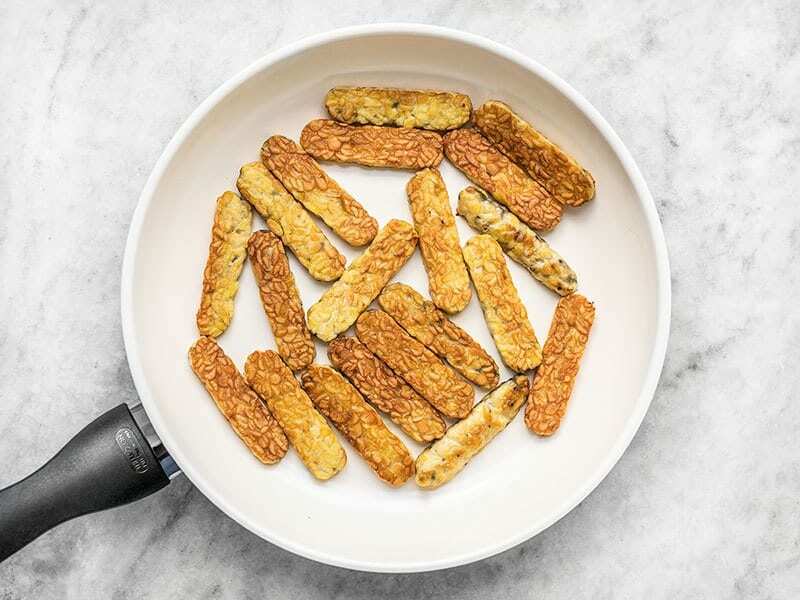 Place the fried tempeh slices in a bowl. Reheat the buffalo sauce and stir until smooth (microwave 15 seconds), then pour it over the tempeh. Stir the tempeh until it is coated in buffalo sauce. 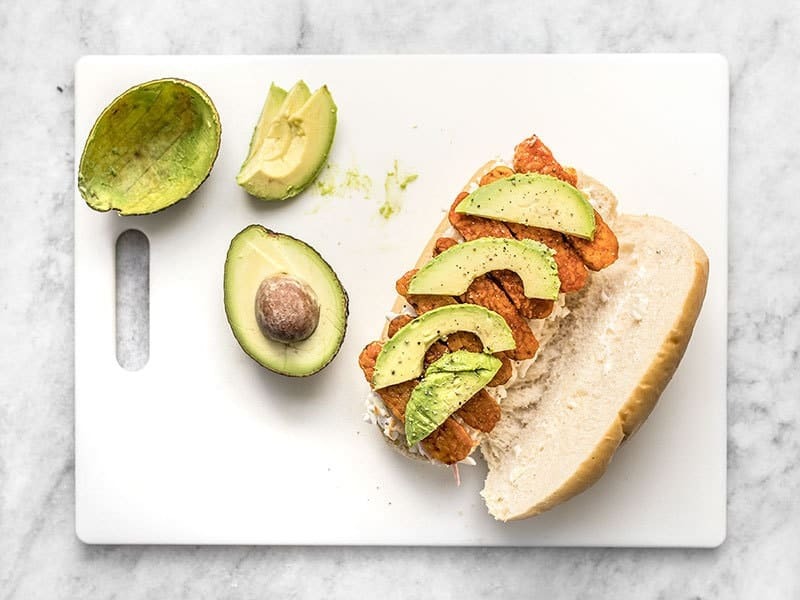 To build the sandwiches, lay down a thick layer of the ranch slaw on a roll, then top with the buffalo tempah and sliced avocado. Enjoy! *These sandwiches were VERY large, so you can also make four smaller, hamburger bun sized sandwiches. 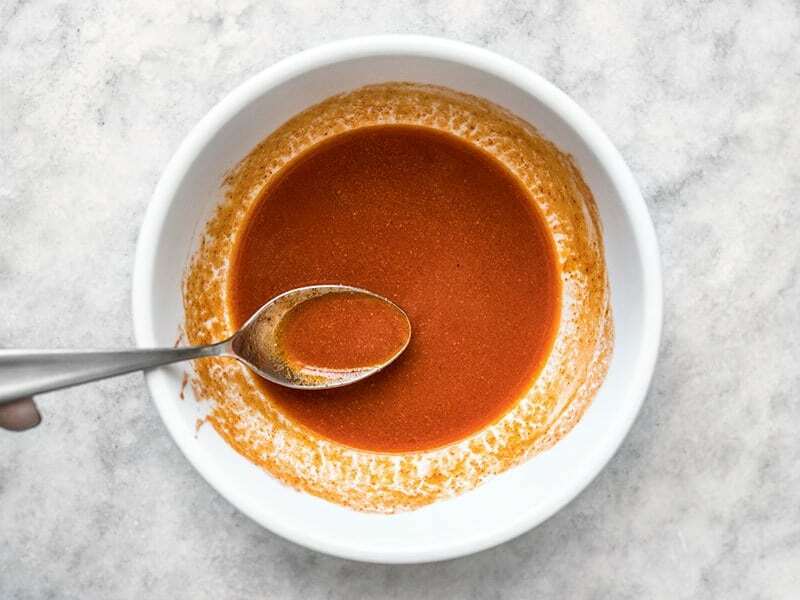 To make the buffalo sauce, combine 2 Tbsp melted butter, 3 Tbsp hot sauce, 1/8 tsp smoked paprika, 1/16th tsp garlic powder, and 1/8 tsp salt. Stir until smooth, then set the sauce aside. The sauce will thicken as the butter begins to cool, so you may need to reheat it briefly later just before you coat the tempeh. I know there are a lot of strong opinions about hot sauce out there, LOL. This is the one I used. 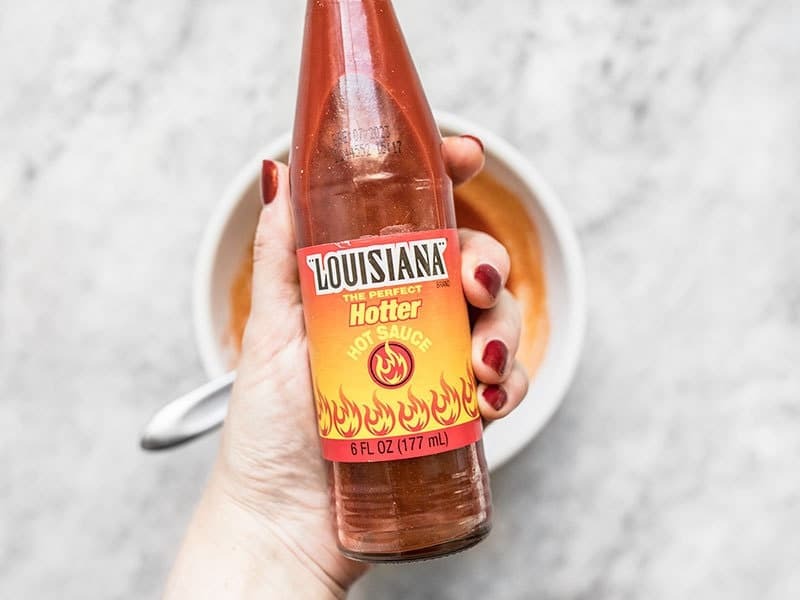 I have also made this buffalo sauce with Tabasco and found it very inferior to this brand, so just so you know the hot sauce does make a difference. To make the ranch slaw, place 8 oz. coleslaw mix (that’s the bagged shredded cabbage and carrots that you can buy in the produce department) in a large bowl and add 1/4 cup ranch dressing. 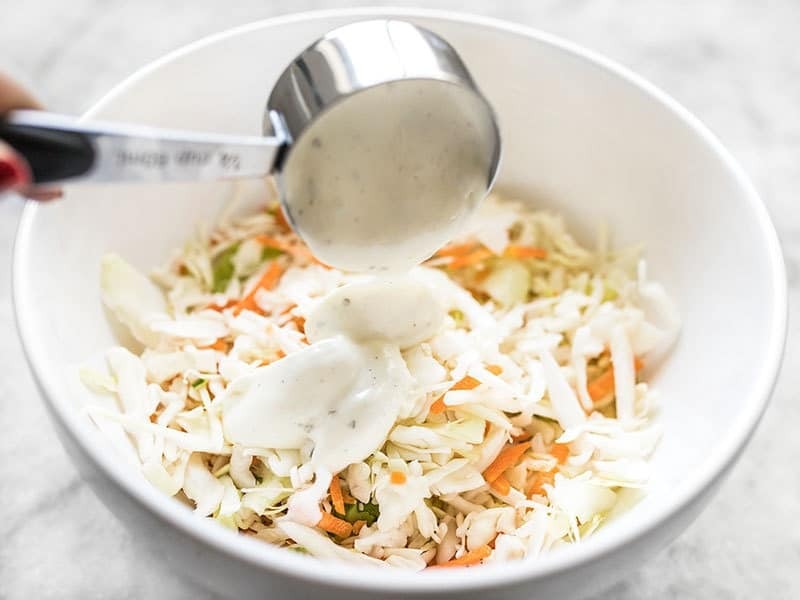 Stir until the slaw is coated in ranch, then refrigerate until you’re ready to build your sandwiches. I do suggest buying a good thick and rich ranch for this. I used Ken’s Steakhouse brand. Now on to the tempeh! This is what it looks like. It comes in a sort of “brick” and you can actually see the soy beans, unlike tofu. 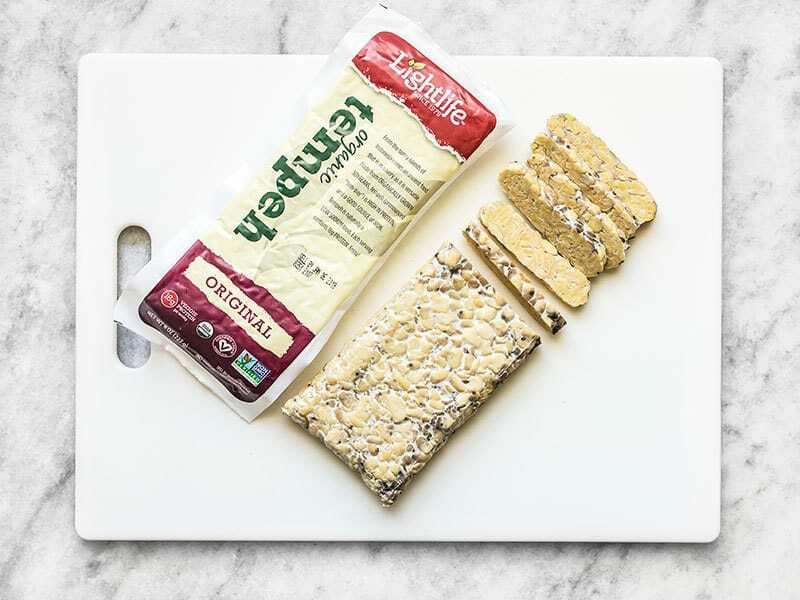 Slice the tempeh into 1/4-inch thick slices. Heat 1 Tbsp cooking oil in a large skillet over medium. Once hot, swirl to coat the surface of the skillet, then add the tempeh slices. Fry the slices until they are golden brown on the bottom, then flip and cook on the second side. You may need to add an additional tablespoon of oil for the second side, since the tempeh tends to absorb the oil. 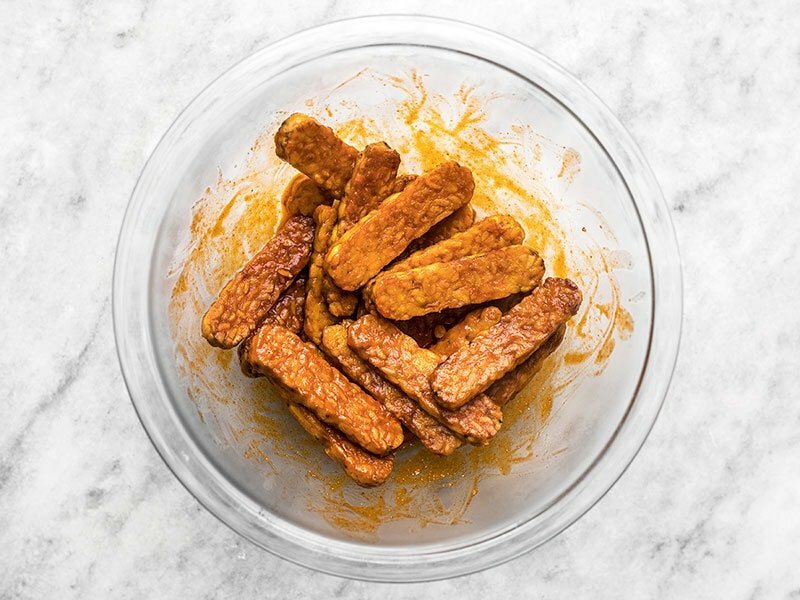 Once the tempeh slices are golden and crispy, transfer them to a large bowl. Microwave the buffalo sauce for about 15 seconds to heat it up and smooth it out again, then pour it over the tempeh slices. Stir until the tempeh is coated in buffalo sauce. Now it’s time to build the sandwiches! Pile a generous amount of the ranch slaw onto a roll (either two large hoagie rolls or four smaller round hamburger-sized rolls), then top with the buffalo tempeh slices, and sliced avocado. 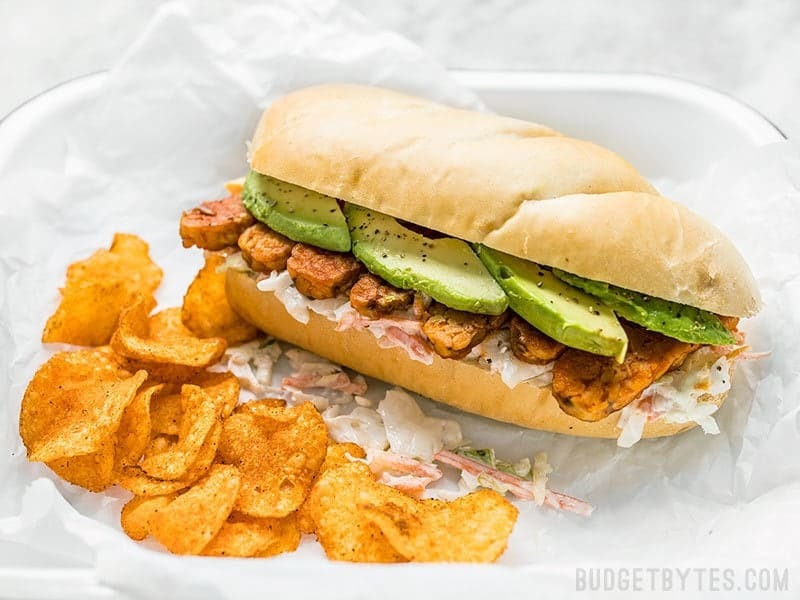 The post Buffalo Tempeh Sandwiches appeared first on Budget Bytes.